Eiko and Koma, New Directions Poetry Pamphlet #8, is the result of collaboration between the world-renowned dance team of Eiko and Koma and premier poet, Forrest Gander, bringing together the intricate and philosophically based dance form developed by Eiko and Koma and the creative poetic talents of Mr. Gander. 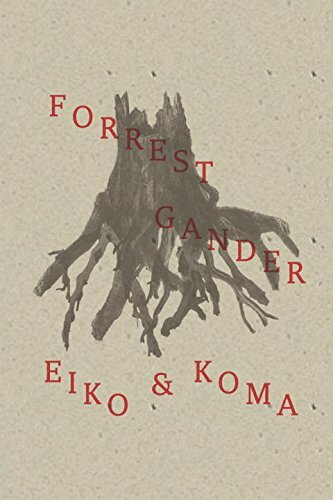 Mr. Gander taps into a wide variety of poetic devices and structurings in close harmony with the dancers’ actualizations in performance, in a mode verging on interpretative adventure. The overall effect in this volume is even more enhanced by several black and white photographs by Anna Lee Campbell of actual performance modes. The photographs are stunning, thus adding yet another art form to the mixture and serving to further enrich the exploration of this volume. Then, of course, consider the poetry, the sine qua non of the volume: the usual techniques of poetic form—line, stanza, punctuation, and the like—either subordinated or set aside and altered to fit the comfiture of the overall direction and meaning of each individual poem directly addressing a performance mode. Certain concrete forms of poetry are employed to great advantage. Repetitions and metaphoric evocations are freely employed. In concert with the dancers, with the dance, and in the panorama of it all, this poetry expands the consciousness of careful readers and observers—becoming, in the end, part of the phenomenon of transcendence that such collaboration brings about. In considering individual poems, it is important not to forget context: what does Eiko want? What does Koma want? What will they give? Will it be revealed? And how does poetry help us to know? If you read and consider this volume carefully, it will continue to give, and you will find answers and answers to just what is withheld and how much is given. But along the way, try to stay in touch with the complexities of this volume—just how multidimensional it really is. In the first poem, “Faithfulness,” there is a careful tracing of the human form in dance, an outline of action, interactions, complete linear demarcation, a tracing of characteristics, observance of attitudes, positionings, posturings, contortions—of two bodies in movement, shape in stasis, in spasms, in attitudes of shaped whimsy, in emotional awareness, a spent and mutual finding, all with the understanding that a “person’s life might change with/a gesture or shaping/.” This is yet another excellent example of Mr. Gander rendering the evocations from dance movements in the language-tents of poetry. This is indeed ekphrastic translation. In the poem, “Rust,” Eiko and Koma come to one another undefined. Even observers might wonder what they are, even what form, wonder what parts intertwine what parts, cause a wonderment of the possibility of habitation from a world of flowers: “Incarcerated orchids,” writes Mr. Gander. In “Projecting Love,” Mr. Gander’s opening lines: “dragging her fingernails across the air as/stage left, he steps from darkness into his flesh/,” offer little toward a solution, as further evocation only leads to the abstract. “The Caravan Project” is a venture into another world, essentially an underworld in which the dancers’ purpose as man and woman is in question, as if everything contained is determined by the controlling moss, “…their whitened bodies lifting, pokily, like trilliums from a bryophitic carpet.” Mutual purpose is in serious question. The poem, “Entanglement,” on the other hand, is quite a bit more definitive as the pair emerges from a long float “…From cellars of sleep./Here on the earth’s wet/set. Hair and leaves mixed/with leaves and hair. Vision sheared/to make room for vision./Two figures and/the caesura of/longing…/” This emerges as love story. As an example of the far reaches or extensions of their combined craft, there is something special to be said about “Naked,” the last poem in this collection, perhaps the most evocative and/or descriptive of the complexities of the combined offerings (Eiko and Koma in their many manifestations) and of this poet, Mr. Gander, who has so creatively revealed these complex phenomena to us—and so patiently. It is, after all, in the pure rawness of their evocation that Eiko and Koma are revealed as dancers at their best, at their work, at the pure work of sharing their unique talents and philosophies with the world, and that is where we find Mr. Gander—in full pursuit of the inner workings of their quest. In this final poem, “Naked,” look for the wide variety of modes of nakedness that have been captured among the extant offerings of Eiko and Koma over so many years, offerings that provide the wealth of insights made available to astute observers, and especially to Mr. Gander, who has afforded them this wonder.